Flavor Text: The voice sounded like their old friend, Vaughn, long thought lost. Dormant for a low cost event ? Strange. I'll expect this to be most often self-directed to replace a bad hand. 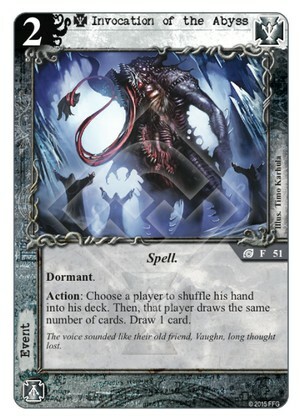 I think the best use of this card is in a Twilight/Cthulhu deck, where just the presence of an unidentified dormant card can have a powerful deterrent effect on the opponent. Its effect when it goes off is nice enough--used on yourself or the opponent, depending on how happy you are with your hand. I can't imagine ever playing this card from hand at cost 2. Not a fan. I'd much rather have a card like Supernal Prism that can give me card advantage as well as mess with my opponent's hand. Hand-fixing for the sake of hand-fixing, even if IofA replaces itself, isn't worth a slot in a 50-card deck. And when it gets unlocked from Dormant, your opponent will probably just breathe a big sigh of relief and say, "Oh, good, I was worried that Dormant card was going to be something dangerous." Just put more of the actual dangerous Dormant land mines in your deck, and leave out the duds.